Lyme disease unleashes havoc in the country every year, especially when it starts to get warm. If left unaddressed for long, it can become a severe issue for vulnerable people like children and seniors. It is, therefore, a wise idea to increase your awareness of Lyme disease and to learn how to keep yourself safe from it. The warm months are perfect for outdoor fun like picnics, hikes and long nature walks. Unfortunately, though, the balminess and all the alfresco activities that it calls for is ideal for catching Lyme disease too. A bacterial infection which is usually spread by black-legged ticks, has slowly become a growing concern. It is easy to misread the indications of Lyme disease especially if the distinctive bulls-eye rash is missing. Other signs of this disease overlap with those corresponding to different health conditions. Even though Lyme disease can be cured fully with antibiotics, a slow set-in period and unclear symptoms pose a significant hindrance in its prompt detection and treatment. Stay Away from Tick Infested Places – Ticks are found in green belts like the woods, parks or camping grounds. Catching a tick is easier when you are wading through thick vegetation, and so it is safer to avoid such adventures. This does not mean that you need to stay away from parks or hiking trails. Just make sure that you spray yourself with an insect repellent that contains DEET. 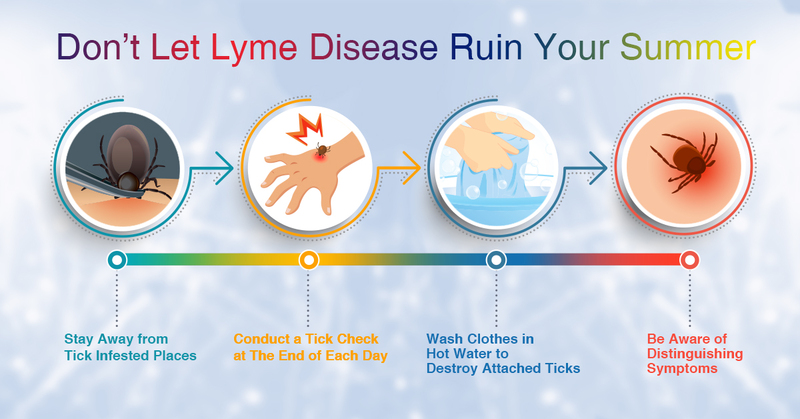 Wearing long-sleeved shirts and full pants with socks can also help prevent a tick bite. Conduct a Tick Check at The End of Each Day – Crevices and folds on the body, like armpits, which tend to be warmer and moister than the rest of the body are preferred by these ticks. At the culmination of each day, examine yourself thoroughly for ticks. If you spot any, use a pair of tweezers to extract them. Make sure you check not just yourself and your family but also your pets for these little pests. Wash Clothes in Hot Water to Destroy Attached Ticks – Change out of the clothes that you were wearing outdoors as soon as you get home. Wash these clothes separately, preferably in hot water to get rid of any ticks attached. Be Aware of Distinguishing Symptoms – The most common symptom of Lyme disease is a rash that looks like a bulls-eye at the place where the insect has bitten. However, not everyone with Lyme disease will have a rash like this. Other symptoms that accompany Lyme disease are quite generic and include fever, general malaise, swollen lymph nodes, and inflamed joints. If you have these signs and someone around you has recently been diagnosed with Lyme’s disease, it is worthwhile to get yourself tested as soon as possible. The importance of prevention and quick detection of Lyme disease is higher when it comes to seniors and young children. Keeping in mind the points mentioned above whenever you head out to enjoy a day of revelry in the sun can help immensely in keeping you and your family safe from Lyme disease.